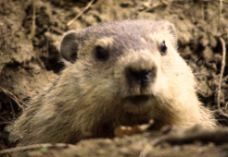 To easily visualize and hear marmot diversity (or lack of it), here are all the original sounds and photos housed in The Marmot Burrow. Alarm calls are saved as .aiff documents--most plug-ins should be able to play them. five-note golden marmot alarm call from the Karakoram (D.T.B. ), three note long-tailed marmot call from the Altai (Alexander Nikolskii). recorded by T. Litzina and Alexander Nikolskii. ascending, descending, flat, and trill (D.T.B.). chuck, whistle, and trill (D.T.B.). ascending, descending, flat, trill, and kee-aw (D.T.B.). Hoary marmot stuffing its face on Mt. Rainier (Alan Turner). 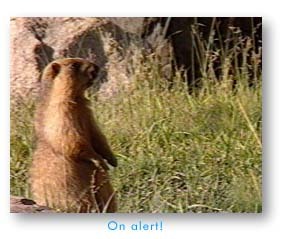 Yellow-bellied marmot alarm calling in Colorado (D.T.B.). Golden marmot alarm calling in Khunjerab National Park, Pakistan (D.T.B.). Alpine marmot looking in Berchtesgaden National Park, Germany (D.T.B.). Bobac marmot on the steppes of the Ukraine (K.B.A.). Mongolian marmot looking around Mongolia (B&W photo by: J. Batbold). Himalayan marmot on alert in India (Photo: K.J. Singh ). Olympic marmot -- (C) Copyright Jennifer Yu, 1995, all rights reserved. This photo may not be copied for commercial use without the express written permission of Jennifer Yu (yuie@cco.caltech.edu).